At first blush you might think Rackham’s latest AT-43 expansion was another book similar to the recent Operation Damocles Campaign Book. In fact it has as much relation to the Operation Damocles Initiation Set as it does the Campaign Book. It even ships in a similar, although smaller, box that has a front flap you can open to view the contents. Operation Frostbite ships in a box about one-fourth the size of the Initiation Set box. Inside you will find one 128-page Campaign Book, one 16-page Gaming Aid (scenario book), 13 new cards (minefield, special tactics, and Karl a Karman engineer), twelve double-sided terrain tiles, three civilian engineer figures, and lastly two Elysium Crystal terrain pieces. All in all a hefty package. The terrain tiles are similar to the previously released Reversible Gaming Tiles but feature winter terrain instead with ice crevasse on one side and ice flows on the other. 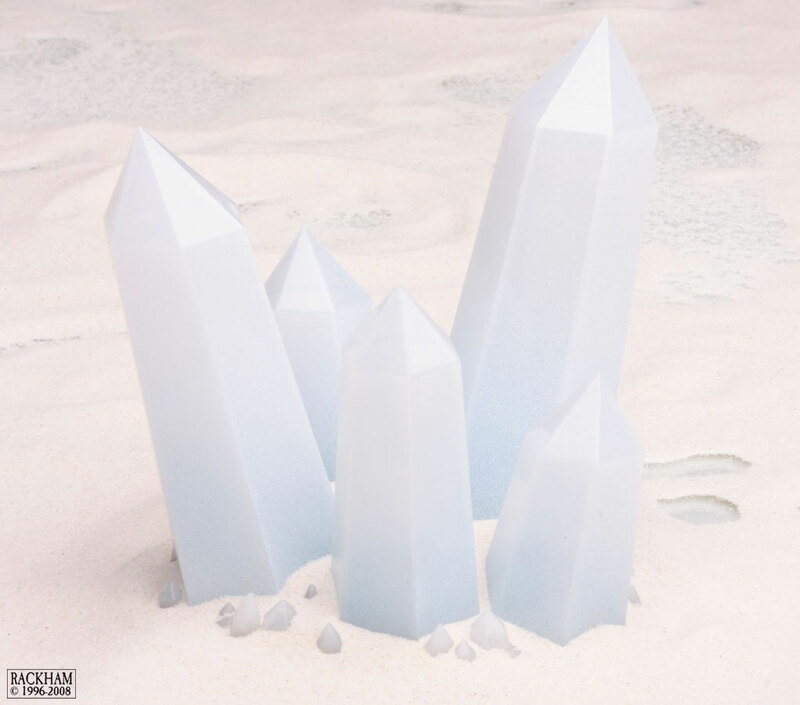 The two Elysium Crystal terrain pieces are interesting, both have a base about the size of the palm of your hand but one holds three crystals and the other five. The crystals are a bluish-white, semi-translucent plastic and look quite nice. The crystal can be arranged as you wish on the two bases. The only problem with them is that the crystals do not have a snug fit and will easily topple over if bumped unless you either glue them or temporarily affix them in some way. Any Karman unit in control of a Crystal gains the ‘Resonance’ ability, which is basically a cover save. Presumably both the tiles and the crystals will be available as separate products later. The crystals especially will be useful in any winter setting. While the actual bunker miniature is not provided a two page template is provided for use instead. This is nice if you do not have any of the actual bunker pieces yet and even includes a top. Permission to copy the bunker template is granted. 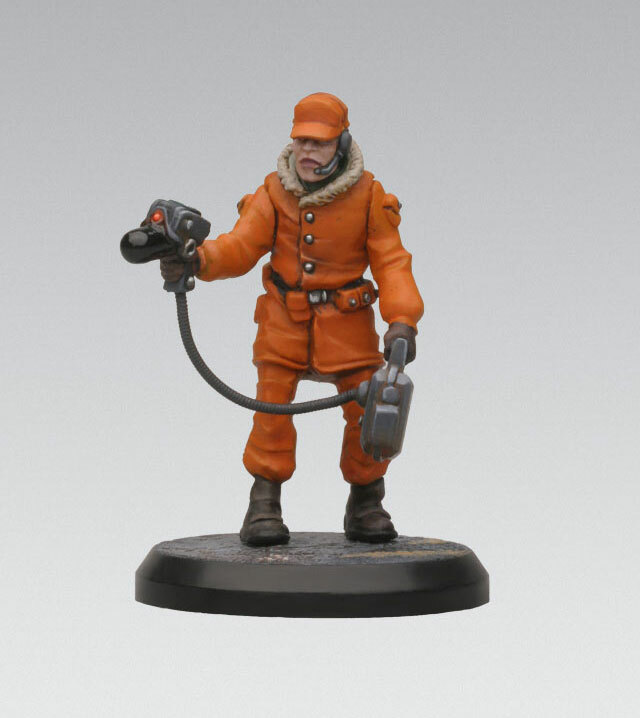 The three miniatures included in the set are civilian engineers. The figures themselves are very well done and even the skin tones are not as bad as previous efforts. Within the game the engineers act as mobile objectives who move with the unit to which they are attached. They are also used in the campaign to represent regular civilians as well, which are also usually an objective. 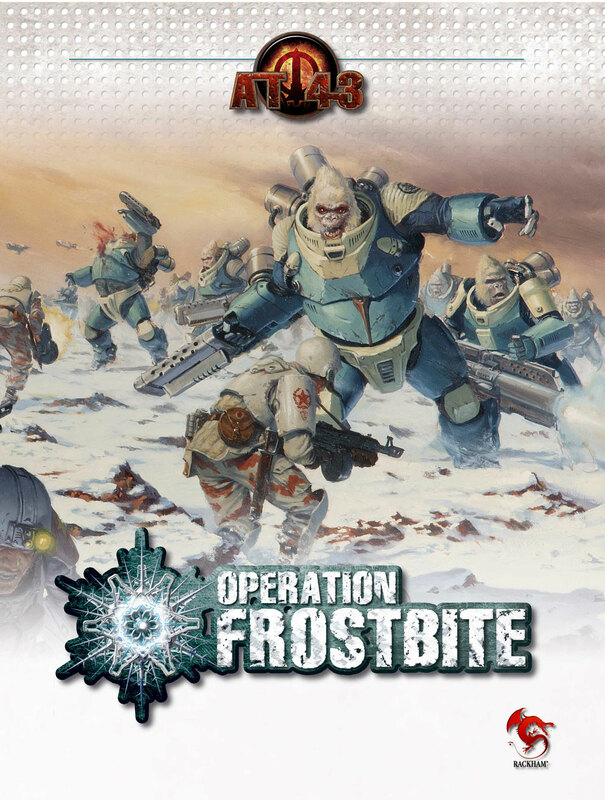 The Operation Frostbite Campaign Book is of course the meat of the expansion. Physically it is a typical AT-43 book (glossy full-color, softcover) and is 128-pages long. It is packed with material. There are only a few pages of fluff and then new rules are presented. These cover the new terrain and miniatures as well as the minefield cards (a new engineer ability). Perhaps of greatest interest in this section are the new rules for Troop Transports. These include armored personnel carriers (APCs) to transport troops units on the field. The rules cover embarking/disembarking, open topped, and other similar topics. The next sections comprise nearly half the book and cover special units and rules for each of the four factions (U.N.A., Therian, Red Blok, and Karman). New platoon patterns are provided, heroes, new support units, and surprisingly, troop transports! For example, the U.N.A. get Lt G. Epstone as well as the official rules for the Death Dealer TacArms. In addition, new support units include two-man missile teams, flamer teams, and bunker units. The Camel D2 is the new U.N.A. troop transport. No definitive image is provided but it is a flying unit that can carry eight troops and has two Light Laser Cannons. The Therians receive two new units. First is the Storm arachn — Basically a walking bomb. Second is their transport the Kraken golgoth. The Kraken also carries eight troops. Again, only a vague sketch is given. The Red Blok get a similar treatment and receive the Dragomirov kolossus with Rocket Launcher and MGauss gun. Their support units are slightly larger with mostly three-man teams. The BTR-5 Soundounk seems to be the Red Blok’s version of the Camel D2. The Karmans get the Dirt Kongaroo as their transport, and it carries four troops and has two Light Drum Cannon. The heart of the book is the campaign itself. The section starts with new campaign rules. It forms a mini game all its own with small battlefront maps and rules for deployment and supply. Operations are broken into weeks and MPs (Material Points) are used to buy special things such as terrain (deploy a wall), spies, transfers, artillery strikes, and more that are used during missions. Those who hold particular objectives also gain strategic advantages (for example, whoever holds Mount Serenity gains the ‘Nerves of Steel’ ability and never takes a morale test). Operation Frostbite itself comprises eighteen campaign missions over four battlefronts. Like typical missions, map layout, terrain, special rules, and objectives are provided for each. What is different is that the forces vary depending on your campaign deployments and how you have done in previous missions. In addition, the map layouts are provided in the separate Gaming Aid pamphlet (probably to save space). Almost all available AT-43 terrain is used across the missions including not just everything provided in Operation Frostbite but the Reversible Gaming Tiles, containers, walls, bunkers, and Nanogenerators. The only terrain product not used is the OD map. As you can imagine the missions cover everything from outdoor fights to close-in room-to-room battles. The last section of the Campaign Book is the Experience section that is identical in content to pages 17-21 of the Operation Damocles Campaign Book. These are decorations/bonuses that units can earn in battle to upgrade their abilities. Because of the nature of the campaign these serve as not just simple upgrades but as a motivator to keep your units alive and not send them to their destruction indiscriminately. Overall, Operation Frostbite is a solid expansion. It provides not just useful new units, miniatures, and terrain but the campaign system seems well done and should provide a unique gaming challenge from one-off missions. Unlike other ‘army scale’ games Operation Frostbite gives a real feeling of being in control of an army and taking and holding ground and objectives. Of course if you are not interested in playing a campaign you can still play the missions standalone. If you enjoy AT-43 this is almost a must-get product.